Our first lesson asks students to create their Ideal cities. We introduced the concept of “Idealism” and showed them that there was an infinite amount of possibility as to what their world could be like. Our goals for this lesson addressed reflect and transfer state standards for art. Students were asked to reflect about the word Ideal and how they could represent their ideas in their Ideal cities. After students created their cities, they transfer this knowledge to the idea of lifelong lessons and about being part of a community. 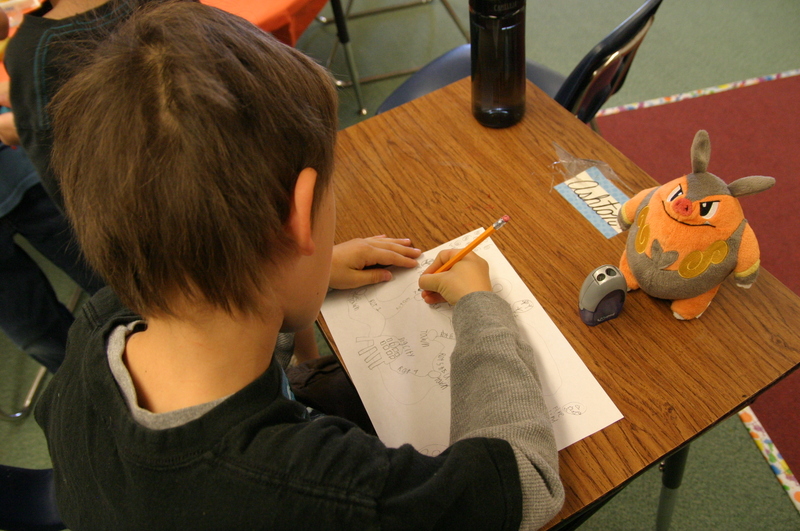 In the second lesson, the students had a more specific focus on making creatures that would go into their ideal world. They gave the creatures ideal features that they found appealing. 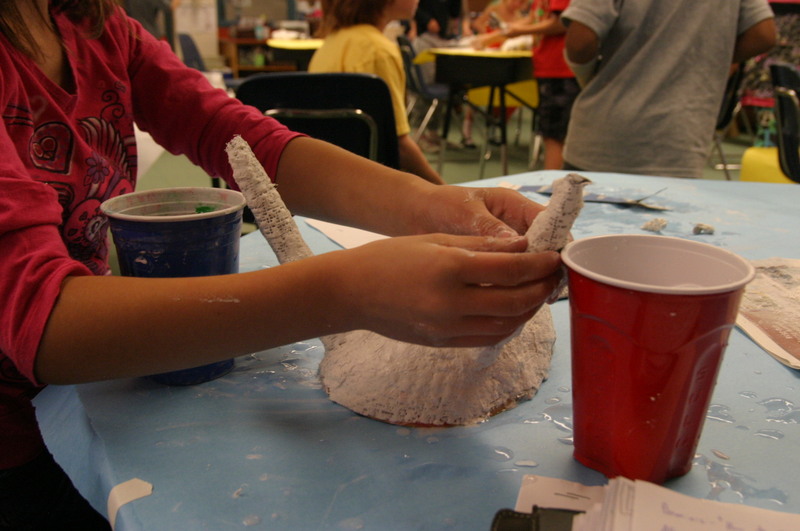 The students used clay to make their creatures and made pinch pots and used the technique of slipping and scoring. Once their pieces had been fired, they used materials such as feathers, balloons, and sticks to add on to their creatures in an assemblage. This lesson focused on the state standard for creating by improving their technical skills in the medium of clay. 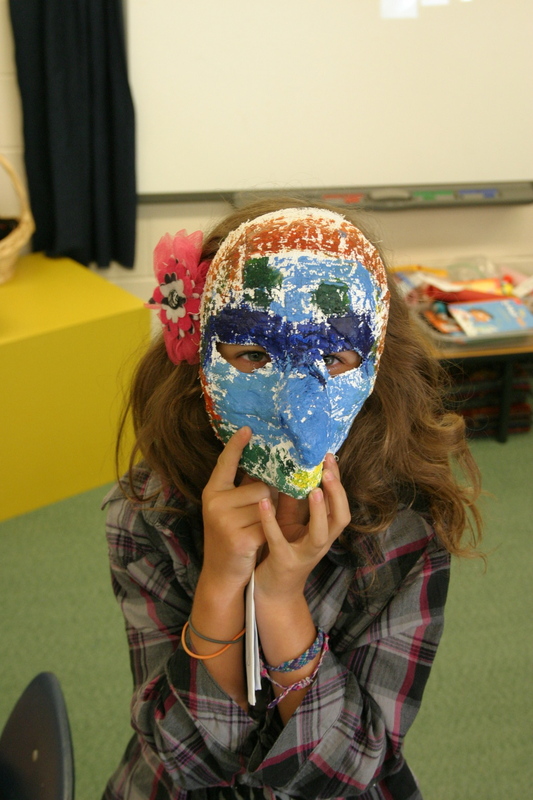 In the third lesson the students made plaster masks out of plaster strips and a face mold. In this lesson they got to pick their masks’ ideal superpower and illustrate characteristics of that power in the form of a mask. Iroquois masks and other cultures’ masks from Canada, Alaska, and Africa were studied as examples of masks in the past that had specific “powers”. This lesson gave an opportunity for the students to work in a media many were not familiar with. 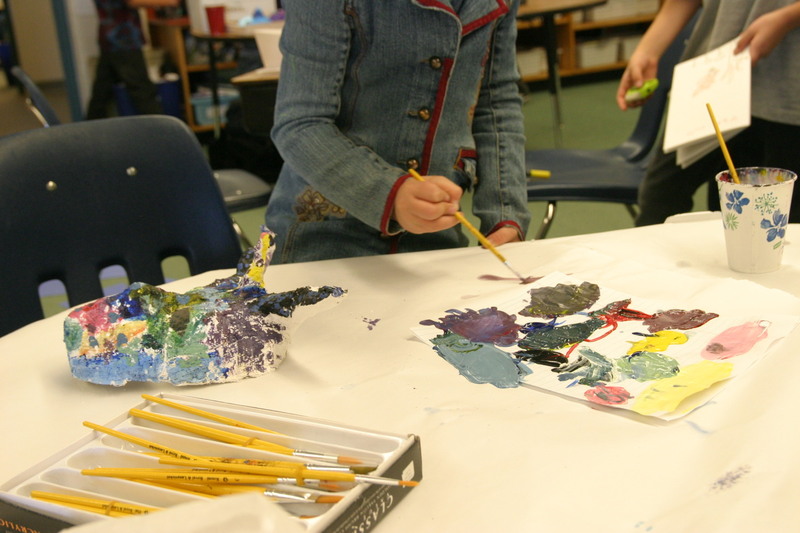 They also learned about color mixing and how to use it. 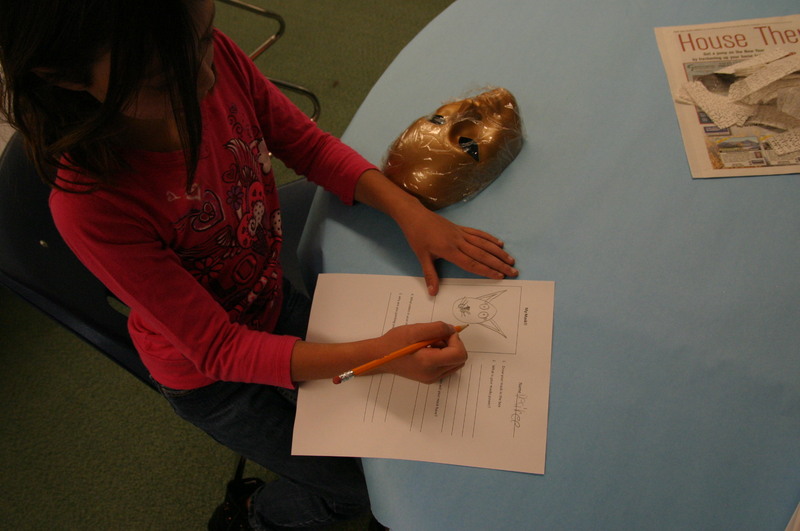 Students were asked to comprehend the use of the visual art to express, communicate, and make meaning of their masks and the features they gave them. They then created a story about their mask to further illustrate the power and how it would work. 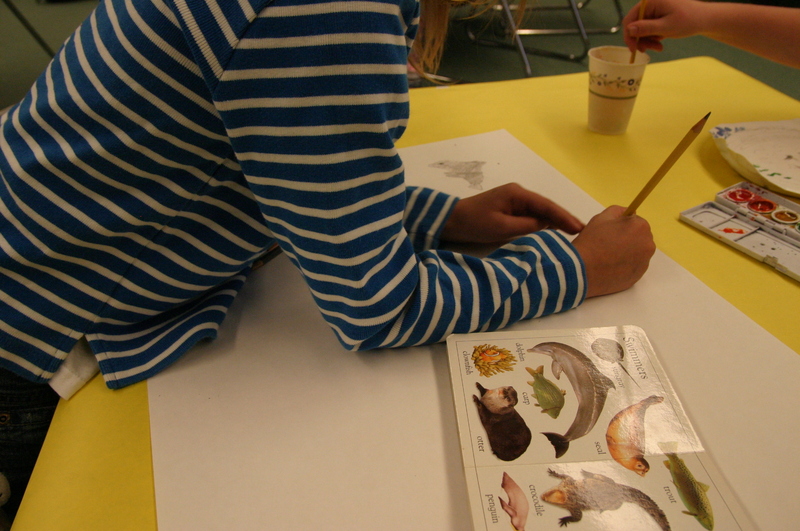 The students learned about the colored pencil techniques of hatching, cross hatching, stippling and color mixing to help relay their ideas. 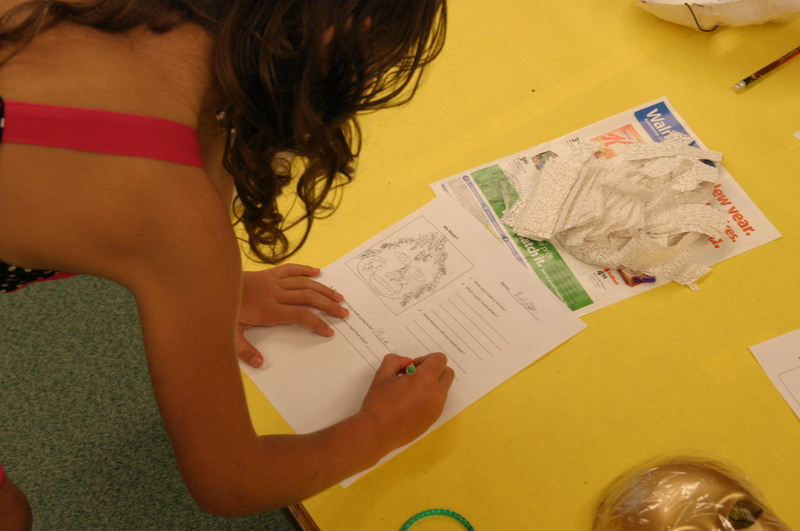 Many kids’ books that were familiar to them were shown as examples and to help relate it to them and give excitement about the idea of being an author and illustrator. The lesson covered the standard idea of Reflect. 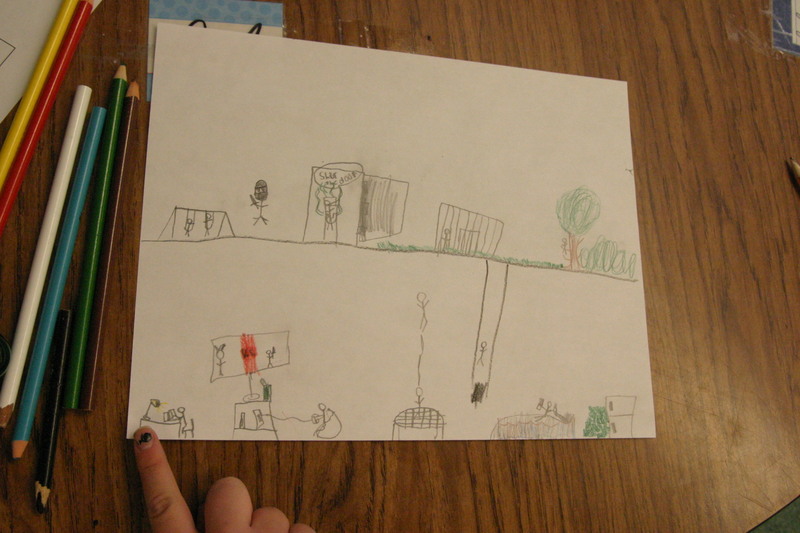 The students envisioned a story and used literacy to communicate a story through art and writing. The fifth lesson, kept the topic close to the student as we had them create their ideal room using a fresco format. This lesson echoed back to the architectural idea of the ideal cities. 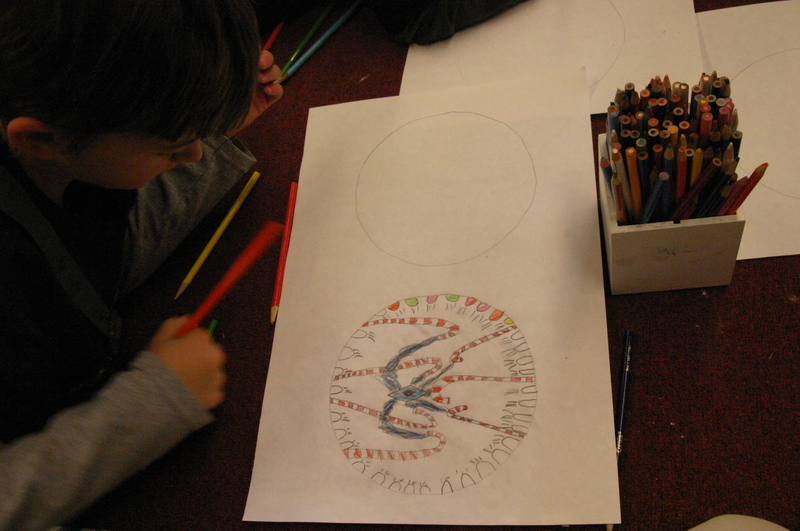 The students studied Minoan and Italian fresco painting as an art history lesson and also had the challenge of working in a circular format. They also did many planning sketches of what they wanted to do and spent a lot of time brainstorming, which covered the reflect standards. 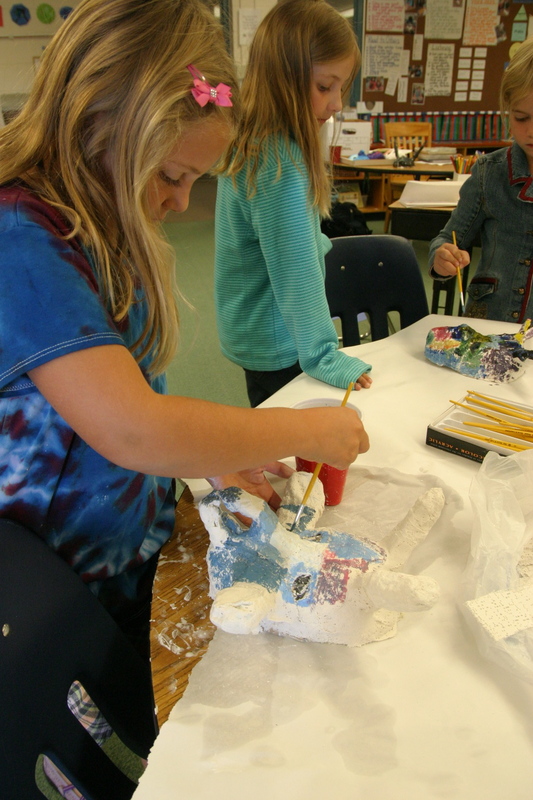 The students connected with art history in this lesson through the exposure to frescoes from the Minoans to the Italian renaissance (transfer). In the final lesson, the students made self-portraits by using collage. 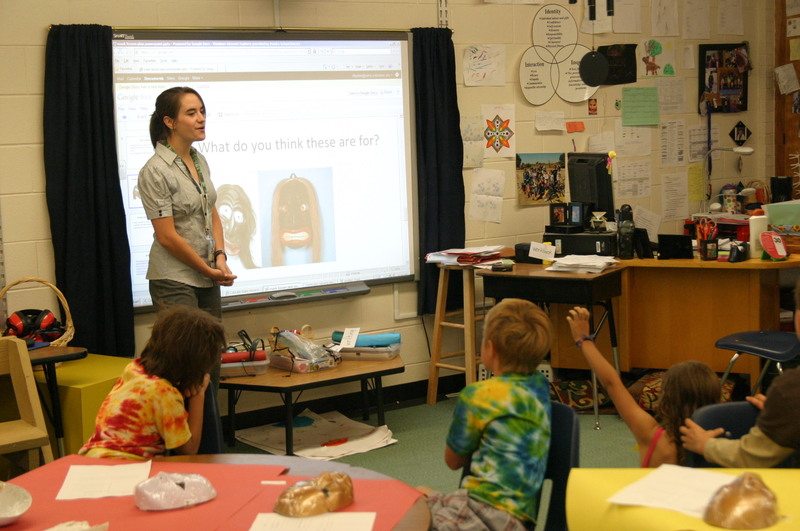 The topic of the lesson was “art as a language of expression.” The students expressed themselves through their material choices and described their “ideal selves.” This lesson rounded out our unit because the students focused on themselves as a small but important part of an entire community. This lesson focused on the transfer standard. 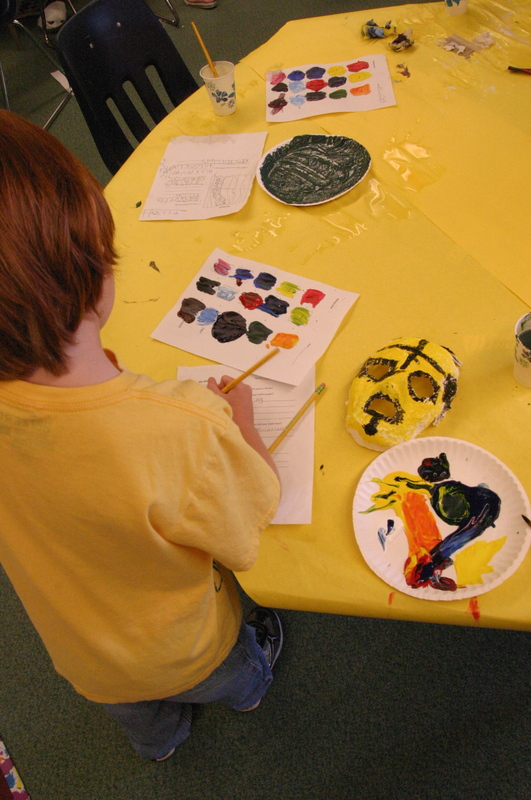 This lesson helped students recognize, articulate, and validate the value of the visual arts to lifelong learning by showing them in order to become their ideal selves; all they have to do is create it. As I walked into the Lab school today, the principal and a student were serenading everyone who entered.I appreciated this support of both art and of student talent. happy thing for all of us to see. 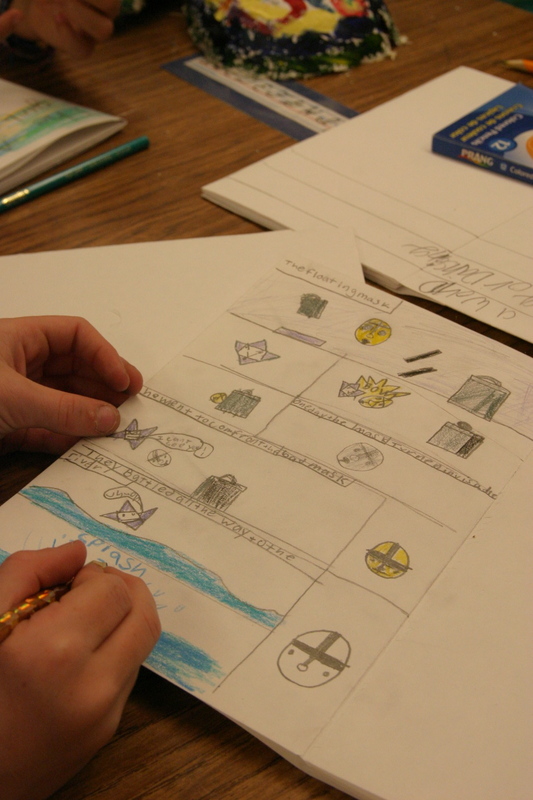 One group of students worked on developing comic books. This student is very interested in Pokemon. He made art that was important to him by creating his own pokemon world map, complete with islands, rivers, roads, cities, and badges you can win. This Student is more interested in drawing realistically from references. She chose to do something that was important top her and developed her skill of looking at an image and re creating it. 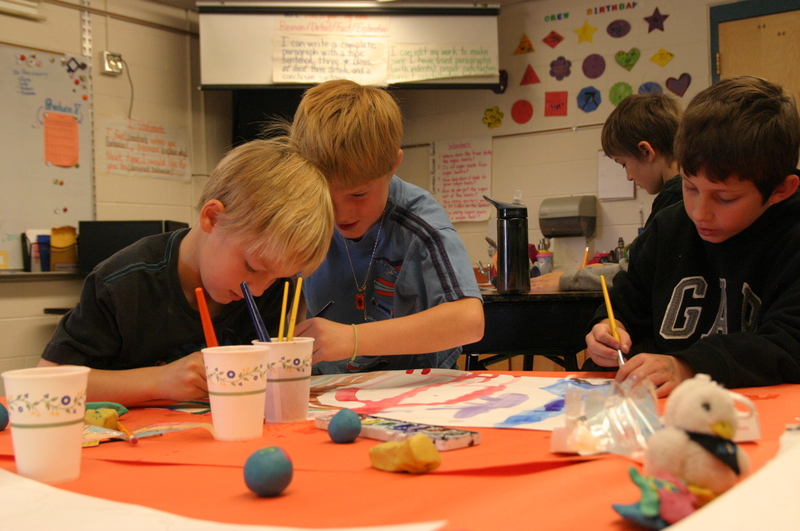 Much to our surprise and delight, three boys decided to collaborate and create multiple paintings together as a team. They fed off eachothers ideas and worked very well together. 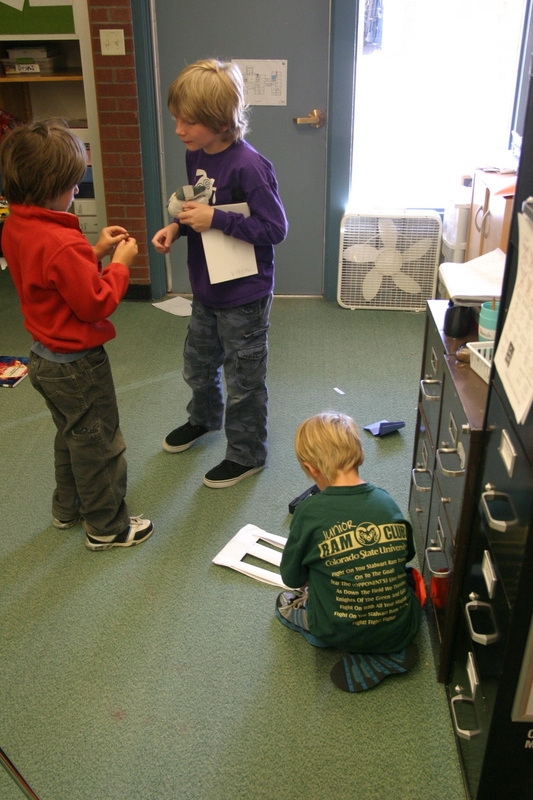 This was definitely a highlight of the day: seeing these boys initiate collaboration! This student is very interested in horses so she drew a happy horse in a landscape. It was really fun and amazing to see what the students came up with on their own without a prompt. We all really enjoyed watching the diversity and the styles of the kids without our artistic influence. Though Jackie did not necessarily teach the kids, they had fun and it was enlightening to see what they enjoyed because now, in the future we can make lessons that they can personalize more based on their interests. 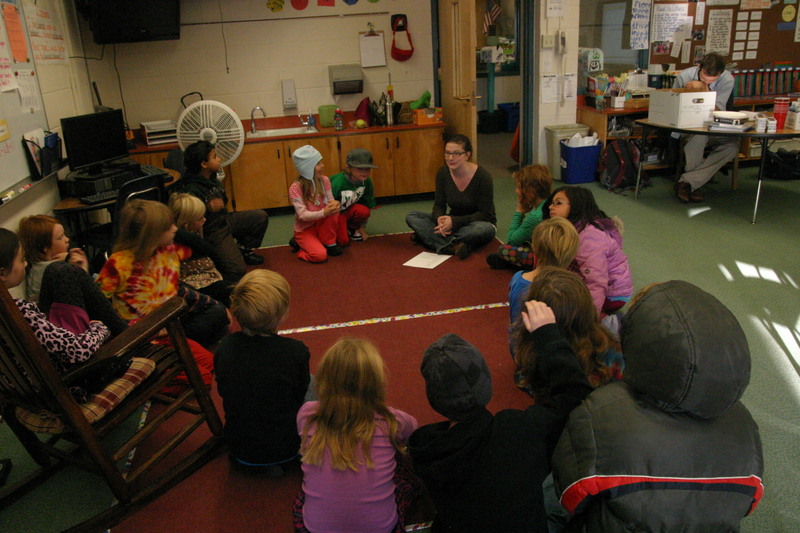 For Jackie’s second day of teaching, Jackie had a short introduction during a circle up. Next, Jackie gave a demo on how to mix plaster. 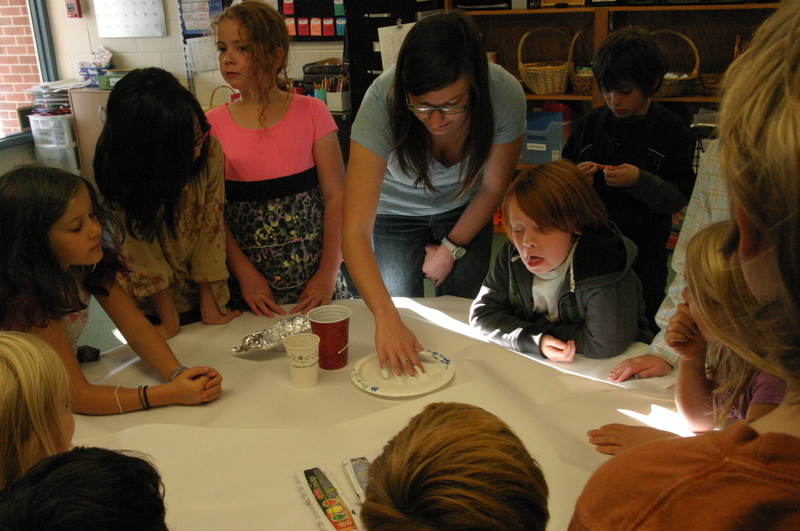 The kids gathered around a table as she taught how to mix plaster and the right consistency. The kids then made their own plaster to paint frescoes into. Luckily, Jackie had planned ahead and mixed extra plaster into plate molds for each student. This ended up being really important, as the plaster did not set up as quickly as planned due to the kids’ lack of expertise in plaster mixing. Many of the kids ended up using the pre-mixed molds, but still got the practice mixing. While the plaster set up, the students worked on drawing their ideal rooms in a circular form, like the plates they poured the plaster into to prepare for their frescoes. Once they finished their drawings, the students started transferring their drawings onto the plaster. For the students whose plaster set up, the students used a pencil to carve lines into the plaster. 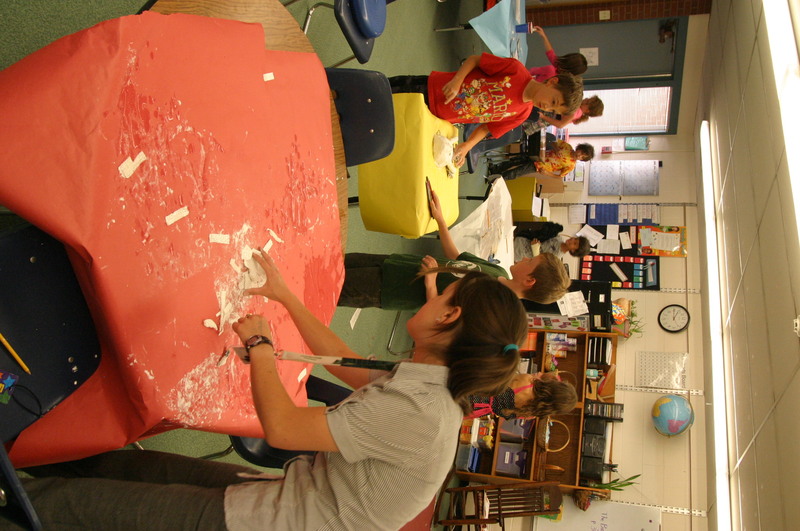 These students created a “buon” on true fresco, painting into wet plaster. The students whose plaster did not set up in time used the plaster that Jackie had prepared. the plaster was too hard to carve lines into, so the students drew on it with pencil instead and created more of a fresco Secco, or dry fresco. A few students had a hard time translating the watercolor to the plaster because the plaster soaks up the color so fast. Many students did not finish their frescoes and will likely work on them next class. 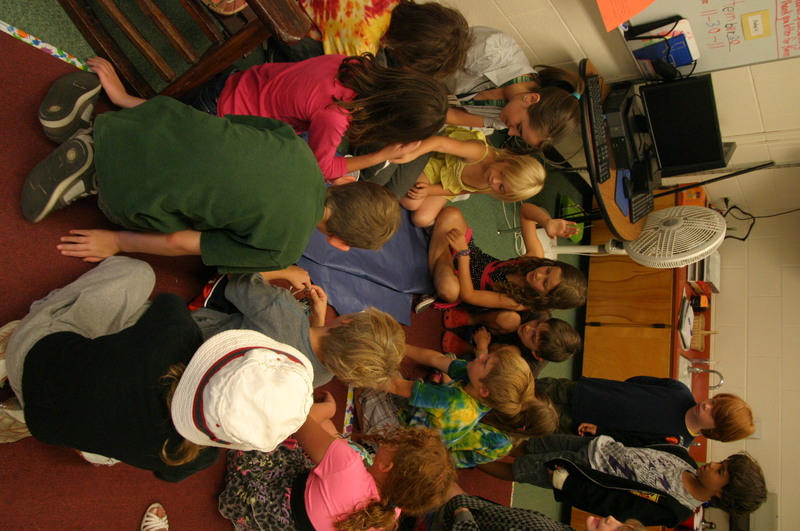 After our cooperating teachers daily ritual of unstacking chairs and thumbs check in, Jackie got to start teaching! they were already in a circle so Jackie used it to have a conversation about the art project she was assigning. She explained that they were going to be making frescoes our of plaster and discussed all the different uses of plaster. 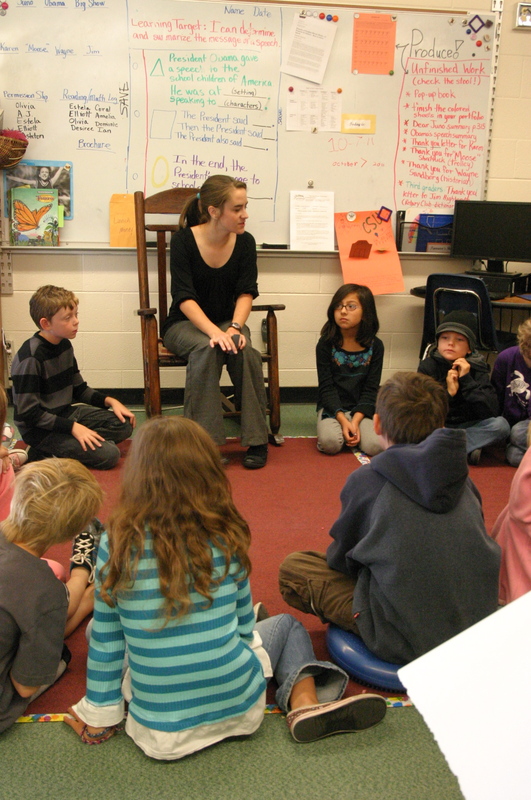 The circle format is really helpful to keep the kids attentive because they are so close to the teacher and are asked to sit boy-girl-boy to help minimize clique sort of distraction.The students were very eager to explain what plaster was and what it can be used for. One student was in a cast earlier in the semester and she used his cast as an example. Next Jackie used the smartboard to show the kids a powerpoint. 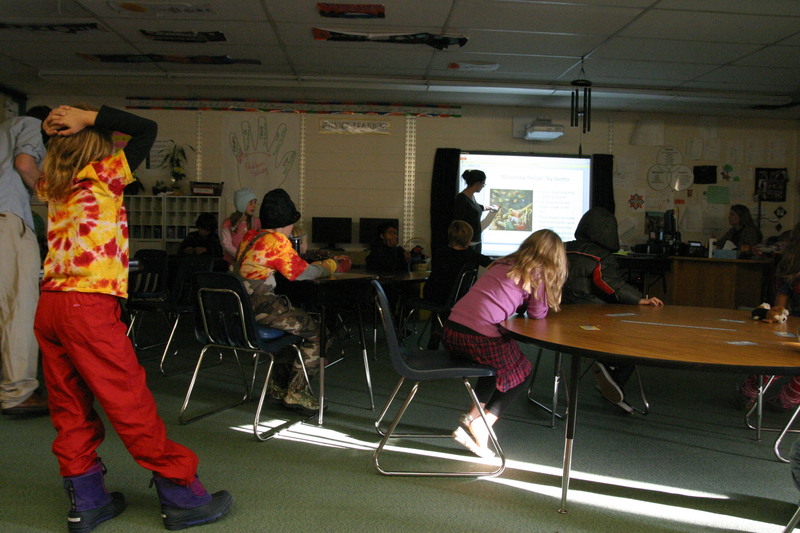 the powerpoint had art historical slides that the kids really took interest in. she had them point out the different sections the artist has used in the sky, giving students the opportunity to get up out of their seats and interact with the art. We were happy to see that a few students knew about Michelangelo and were more than willing to share what they knew with the class. Jackie accommodated one student who asked if instead of sitting she could stand in the back during the slideshow. She was quiet and attentive during the slideshow and standing helped her do so. it reminds us as future teachers to listen to students and their needs and to accommodate them because most of the time they know what is best for themselves. 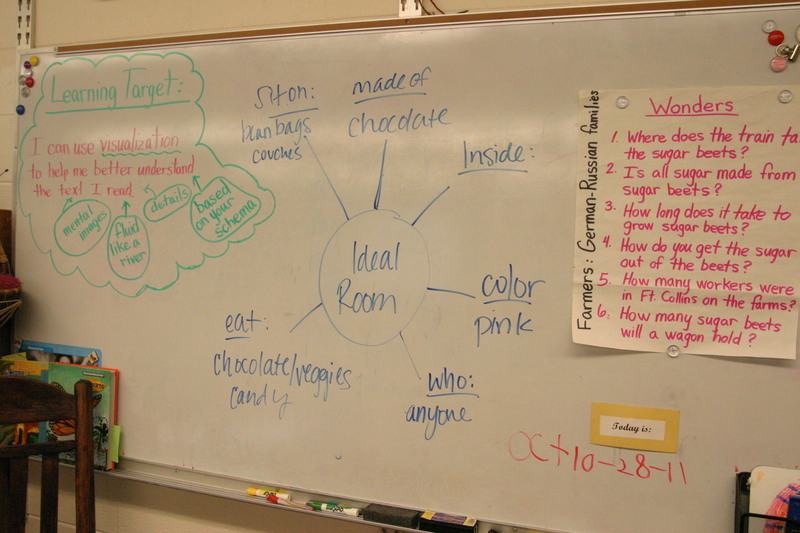 Next, the class had a discussion about what the word “Ideal” means and they did a class brainstorm about what their ideal rooms would be like. This was a really great thing to do because it gave kids more of an idea of what was expected. It was also really important because they were told to fill out a worksheet to brainstorm about their ideal rooms and some are not strong readers. The discussion was a great way to go over what the worksheet said in a fun and productive way. The only thing I have found is a downside of these discussions is that kids tend to copy what is said. For example: beanbag chairs was something mentioned under the category of “What would you sit on in your ideal room?” As I went around to the classroom I noticed that many of the kids were putting beanbags in and nothing else. So while discussion usually broadens ideas, I think sometimes it might limit it. The brainstorming done on the white board. 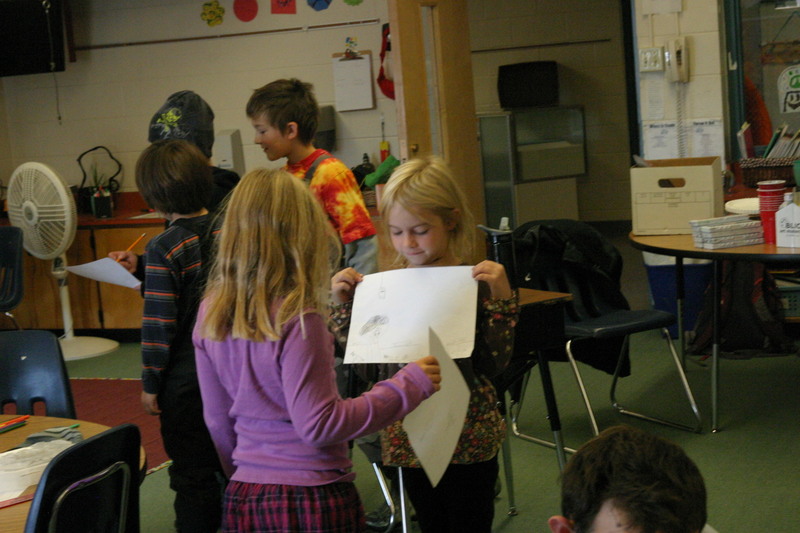 The students were eager to get started on their brainstorming worksheets. They all really worked hard and they understood it really well because of the discussion. As a form of motivation, Jackie went around the classroom with a fresco I painted to show the kids how the fresoes will look. Mine was of a baseball player, not an ideal room but the students always enjoy seeing art from us and this was a way to get students excited about doing their frescoes next class. 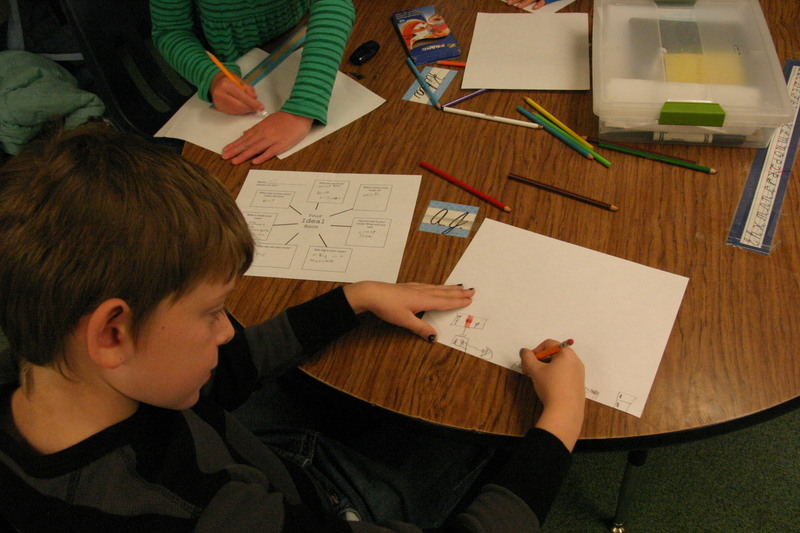 The students then started working on sketches of their ideal rooms. 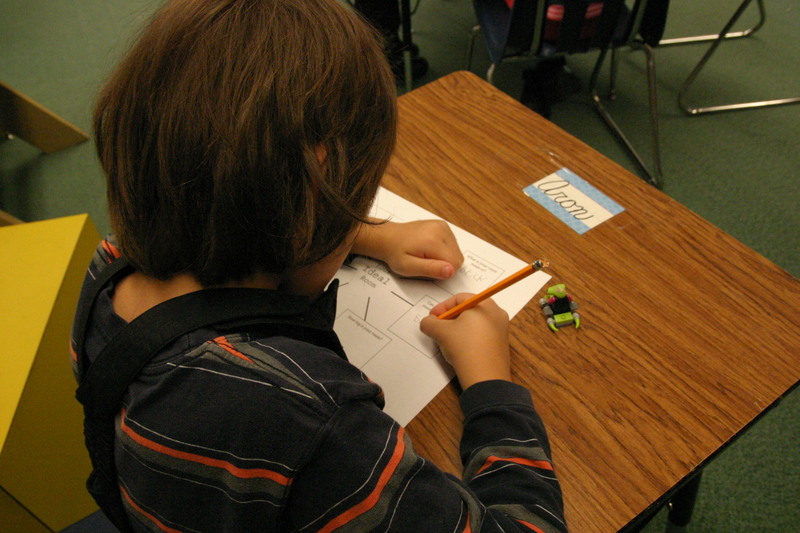 the students now had their brainstorm worksheets to look off of to apply to their sketches. 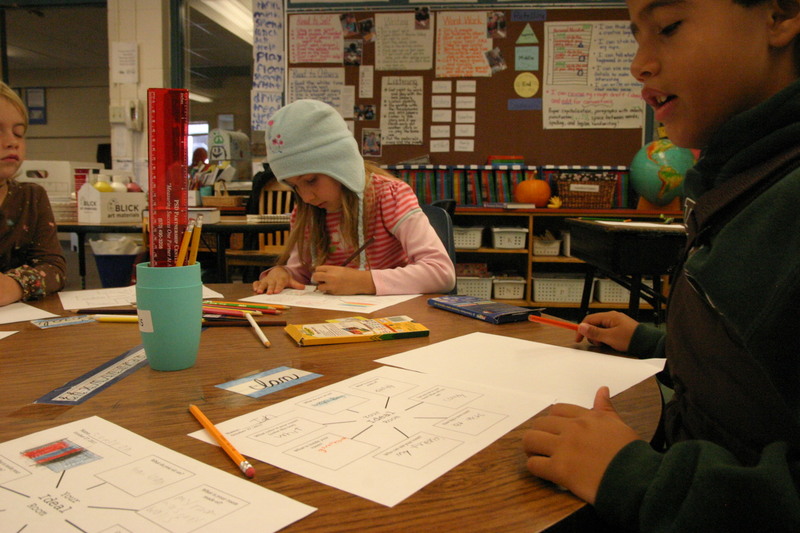 Students work diligently on their sketches coming up with really creative ideas for their ideal rooms. 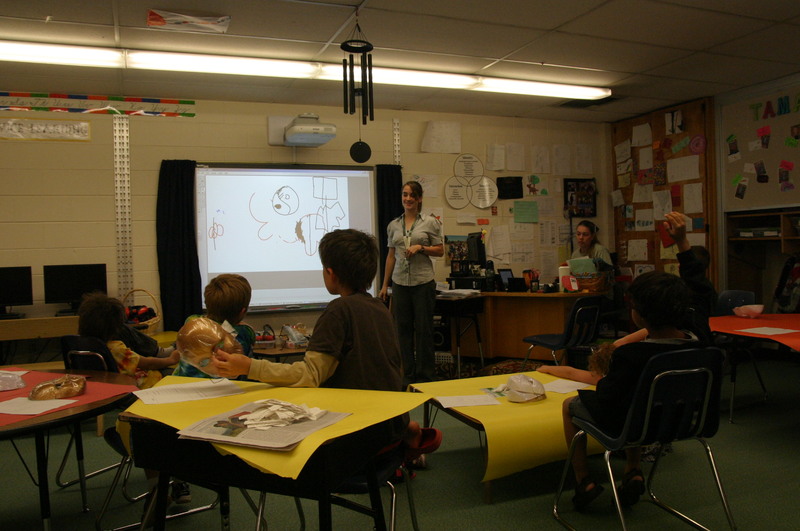 Me, Jackie, and Tanner went around the room and talked to the students about their artwork. they came up with many great ideas. One Student wanted her room to be very colorful and have lots of animals in it. she drew crocodiles, giraffes, and more. She did very well adding places to sit and play. This student is always very detail-oriented. His ideal room has a lot of video games in it. he also included a beanbag chair, a waterbed, a refrigerator, a pile of money and more. The students were eager to share their artwork with their peers which is a great sign that they enjoyed the lesson and that it was meaningful to them. Clean up went really well. When the kids got too rowdy Jackie yelled “FREEZE!” and threw her arms up in the air. 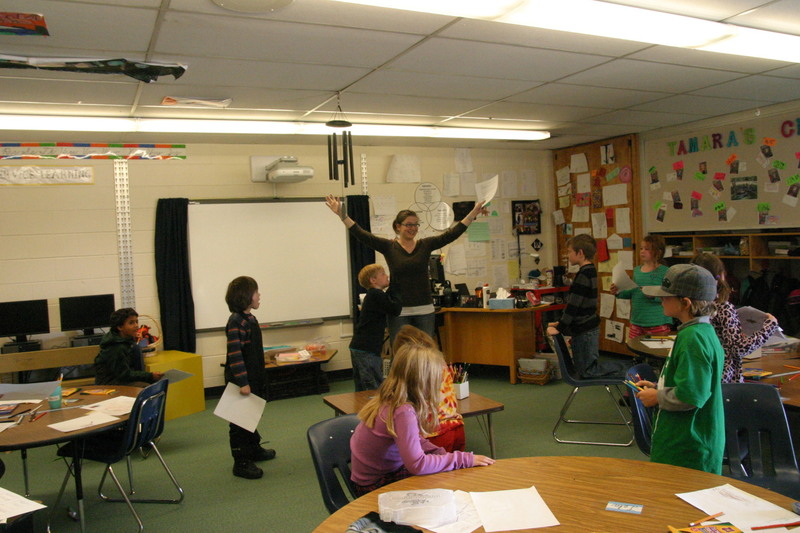 The kids did the same, and it was a really brilliant way to have fun while also getting the attention of and refocusing the students. Ally started the day with the students masks displayed on the front table. As students walked in they were excited to talk about and try on their masks. 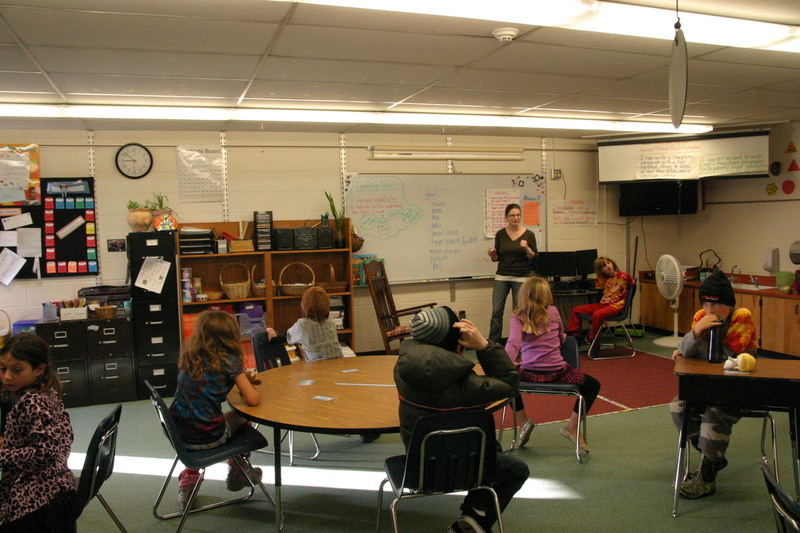 I was happy to see them discussing their work but Tamara had to tell the students to put them down so she could take attendance and do other morning routines. 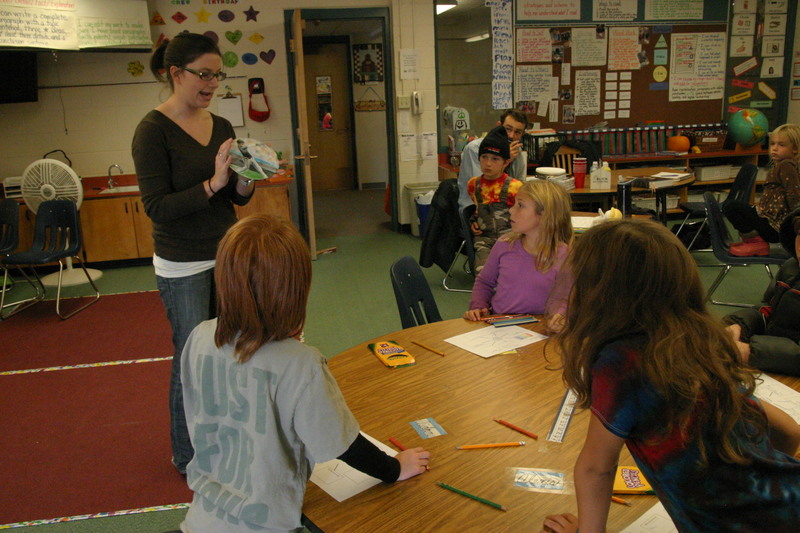 Ally began her lesson by reading the class “How to Train Your Dragon”, the students loved this; and each person gave Ally their full attention. 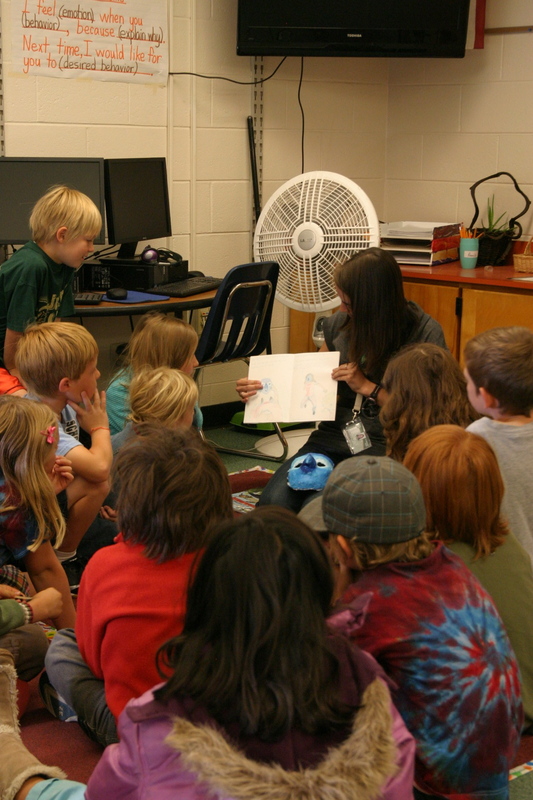 Next, she showed them an example of her illustrated narrative. This was a nice touch because her work demonstrated what was expected in the upcoming assignment. 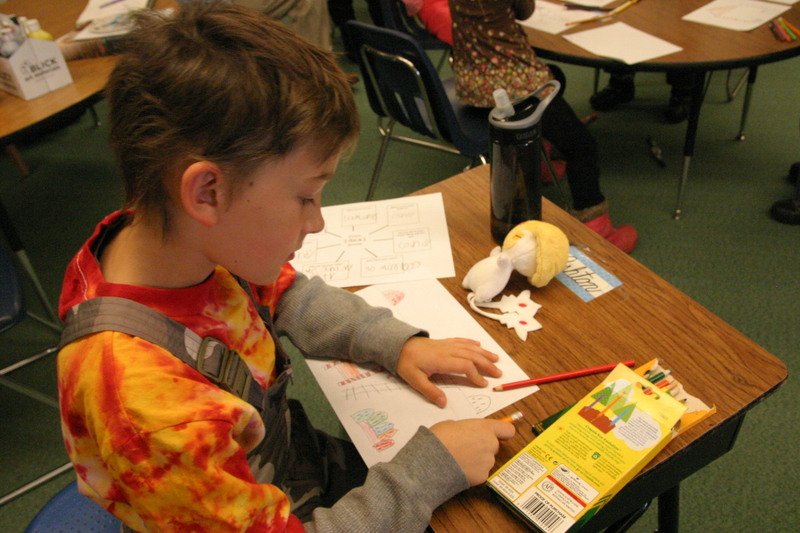 After reading to the students Ally showed examples of drawing techniques students could use in the upcoming assignment. This was a good way to incorperate visuals into her instructions. After Ally’s demonstration A did not seem overly anxious to begin the assignment. I asked, “What is your favorite comic A? Do you think you could draw something like that?” His eyes lit up because now the work was personal to him and be began working diligently. One of the major successes of the day was Ally’s ability to incorporate work stations. During her preparation Ally covered one table with white butcher paper. It was to be used as the painting and plaster station. 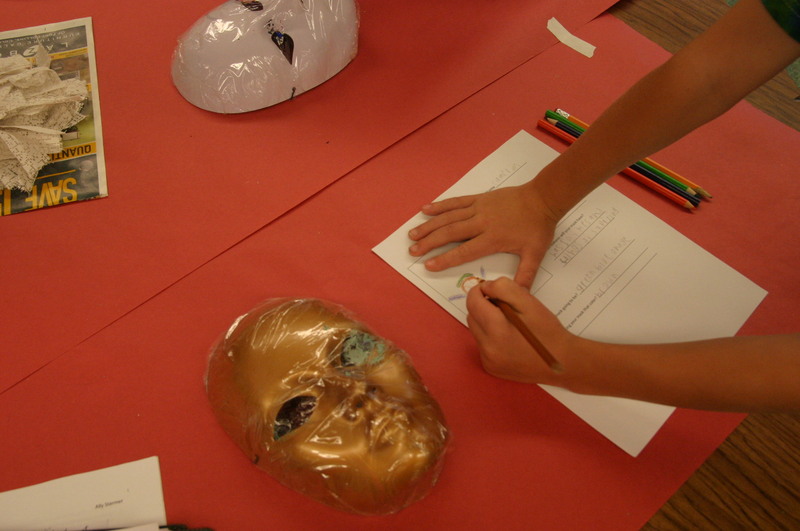 Students such as O who had missed one of the following class periods had an opportunity to finish up their masks while the rest of the class started their illustrative narratives. 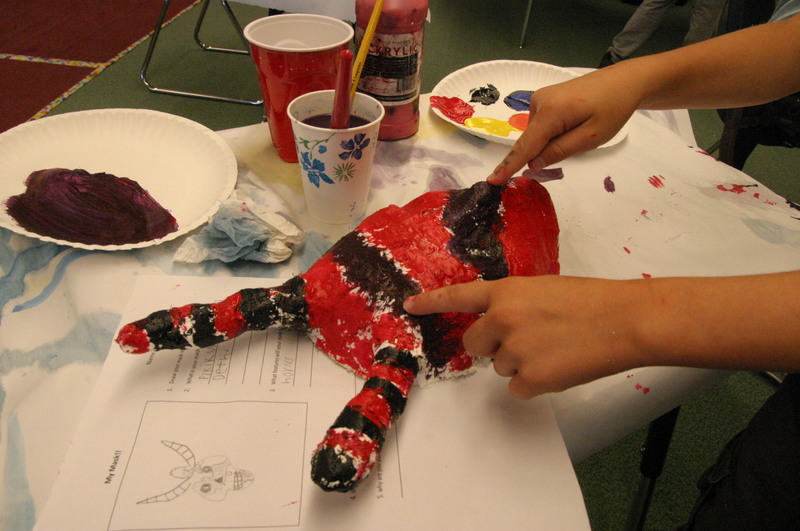 Ally was able to juggle drawing, painting, and plaster all at the same. C was really enjoying art class today, as she began working the whole class could hear her sing, “Purple, purple, purple! I am making purple!” Some students thought her singing was distracting so I approached her and said, “That is a nice purple C, what would happen if you added black to that purple?” She replied, “It will make grey.” Then I asked,”Can you show me?” This was a good way to encourage her excitement about the color purple while calming her down and asking her to focus. While O painted her mask we had a good discussion about color. We talked about how colors have meaning. She said she wanted to make her mask blue like the sky. Then we talked about how A chose to use the color purple to represent that his mask was psychic. I asked her what the color red could mean. It can mean anger. But it can also mean love. We were able to come to the conclusion that not all colors have the same meaning for everyone, but all colors have meaning. A’s comic book provided a teaching opportunity. I pointed out that A had used two Onomatopoeias. I was able to teach the students at his table a fun new word through discussion of A’s artwork. I also asked A to learn another new word and teach it to me next class. Half way through the activity I noticed that E was not working. I approached him and asked him about his work. He told me that he had finished already. I told him that he needed to keep working. Then I said, “E you only get to take art class once a week so you should take advantage of all the time that is given to you.” This classic form of scolding really didn’t work so him so I decided to approach the problem from a new angle. “Instead of this assignment what would you rather be doing? I heard you talking about airplanes and aerodynamics this morning; do you think you could draw those things?” He thought about it and then said, “yes but I will need blue paper.” He ran to the corner of the room to find the construction paper he wanted. Because of this discussion E unintentionally created the fourth workstation in the class room. At first as other students began to build airplanes I questioned if this would become a behavior issue. Looking back on the issue now I am glad that Ally allowed the students to work on their planes. A, who is difficult to get involved in each lesson was very engaged in building planes and talking about aerodynamics with D and E. What good teacher would stop that conversation? 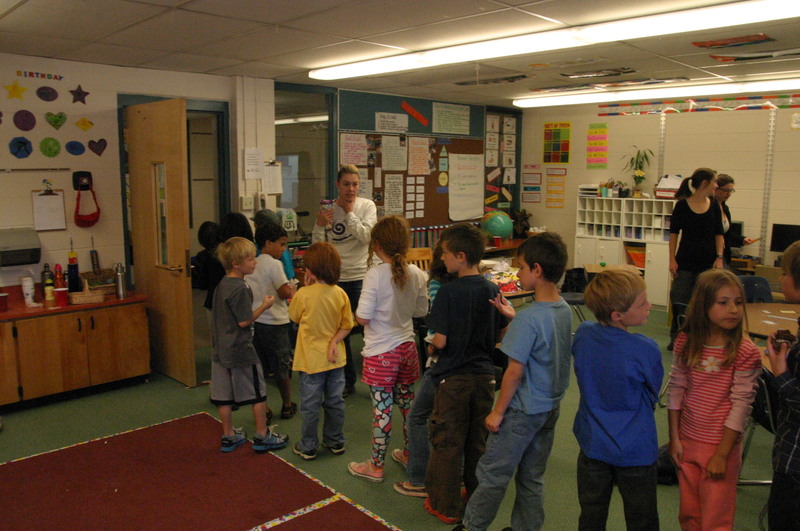 As usual, time flew by and the students filed out the door for recess. 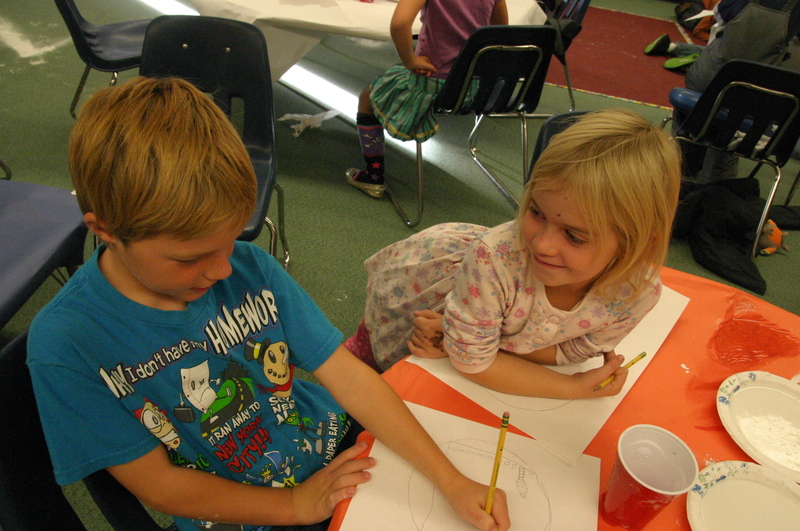 Today students were excited for art class as they walked in the door. 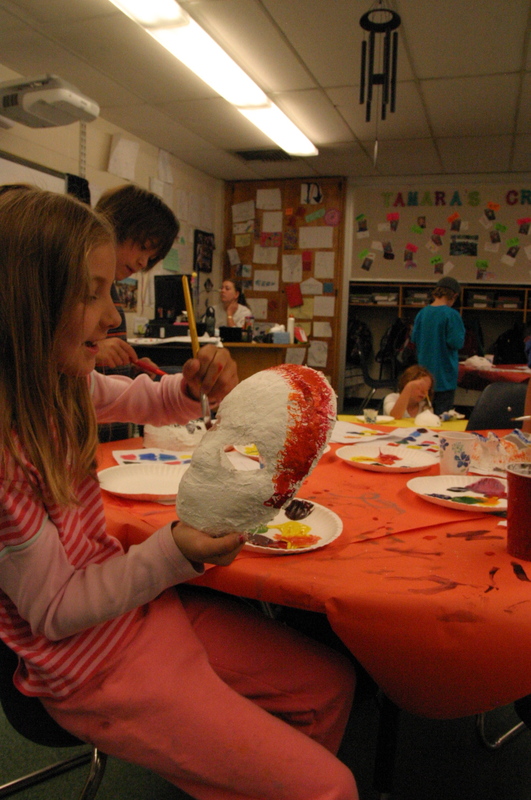 Today they painted the masks they made last week. 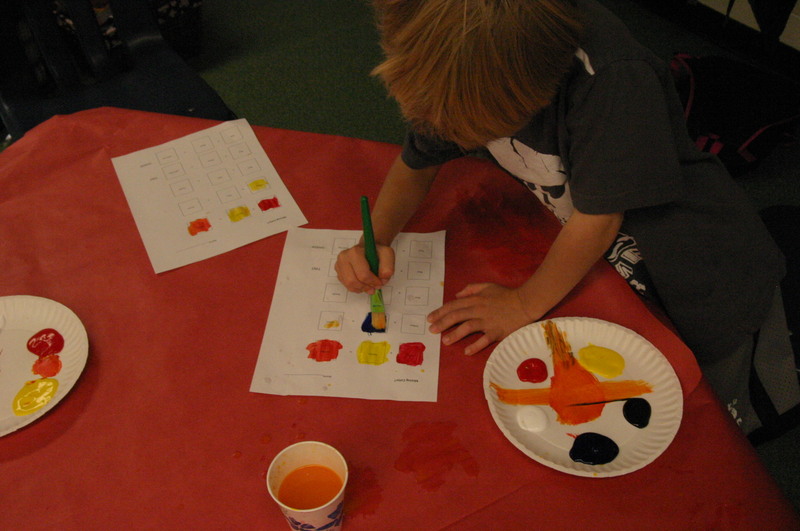 Ally started the day with an informative introduction and an engaging color mixing exercise. 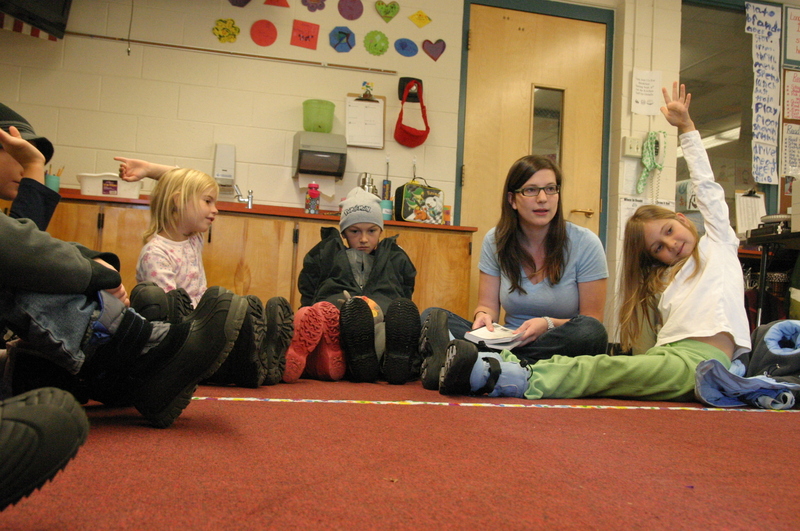 She was patient when gather the attention of the class and knowledgeable of the subject matter. Overall Ally had a very teacherly presence about her which led to a successful day. 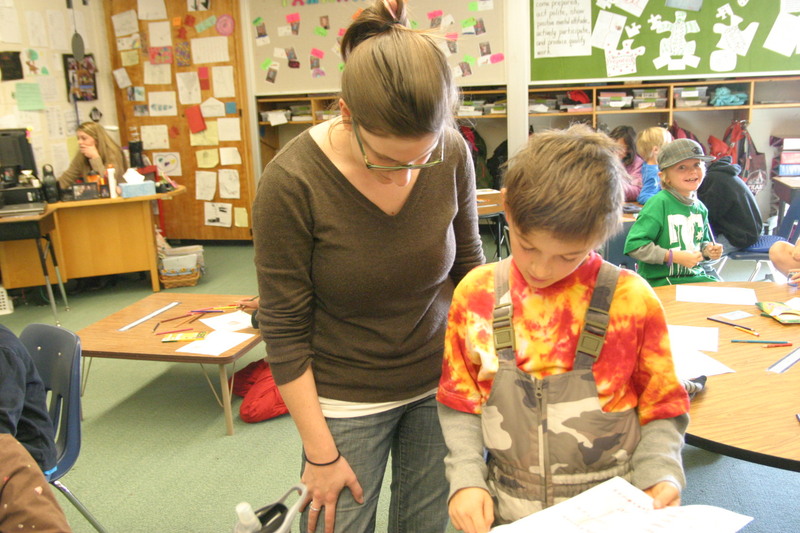 One of Ally’s strengths as an educator is she is knowledgeable about the use of new technologies. 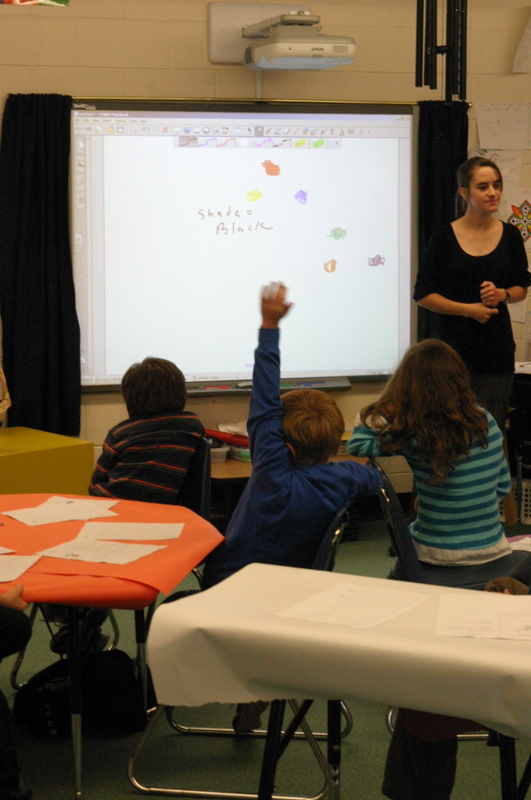 Here she is incorporating the smart board to demonstrate the color wheel. Ally’s color mixing worksheet had the name of each color needed in each box written in large letters. Her work sheet was clear and concise which helped students reach the desired end goal. The student on the left told me he painted a plane as he was mixing his orange. I was torn between letting his young mind express his ideas or asking him to refocus because he was not following the instructions. 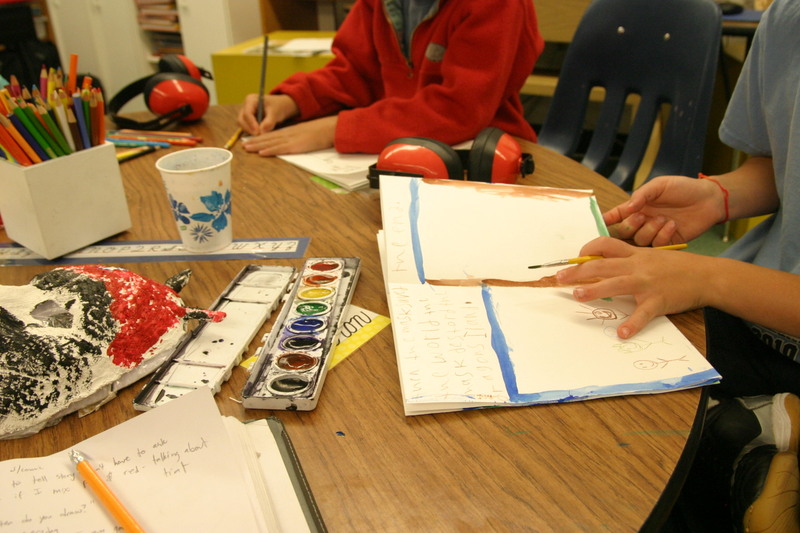 This student liked to mix his colors on the paper while most students mixed their colors on the pallette first. We talked about the benefits of each technique. When I asked the student on the right why she had mixed her colors in a triangle she simply responded that it was the easiest way for her. I was impressed that she instinctively cerated the color wheel. When I asked this student how he achieved the purple color on his mask he explained that the paint had unintetionally mixed with the plaster. I told him that the additional color added an interesting dimension. This student and I had a great discussion about happy accidents. When this student described his piece he explained, “He is pyscic. He can read minds so he can tell where his prey will be.” He said the color purple on his face meant that he was pysicic while the black lines he made only for decoration. I was happy to hear how aware he was of the colors he used as well as what they meant to him. 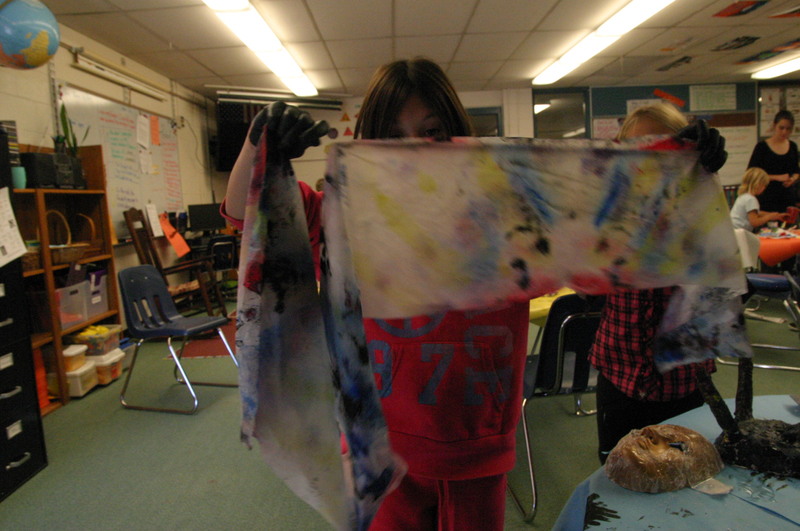 As clean up began this student showed me the paper towel she used during the lesson and said, “Look these are all the colors I used.” I was quick to ask, “Do you think this can count as art too?” Later she found another use for the paper towel, its function turned into a scarf. 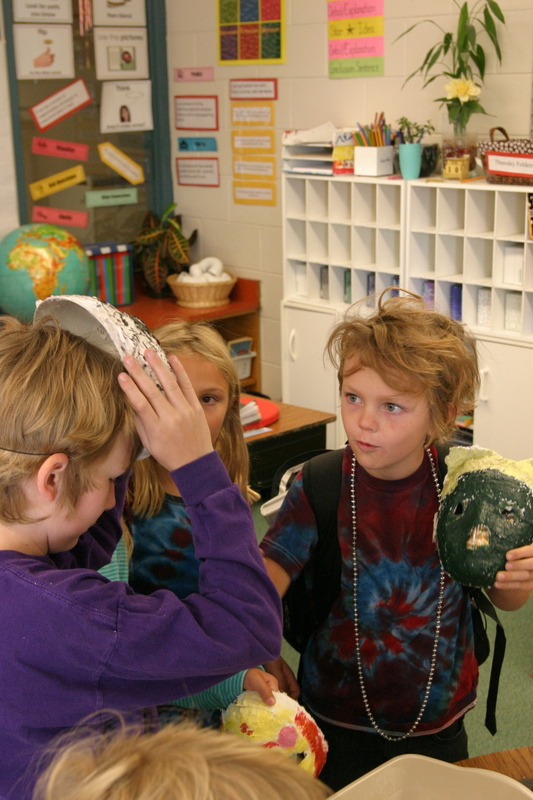 Students were excited to share the stories behind their masks to their classmates. By taking the last ten minutes of class to discuss student work Ally provided a nice opportunity for reflective thinking. Adios friends, can’t wait until we meet again. Today Ally taught her first lesson. 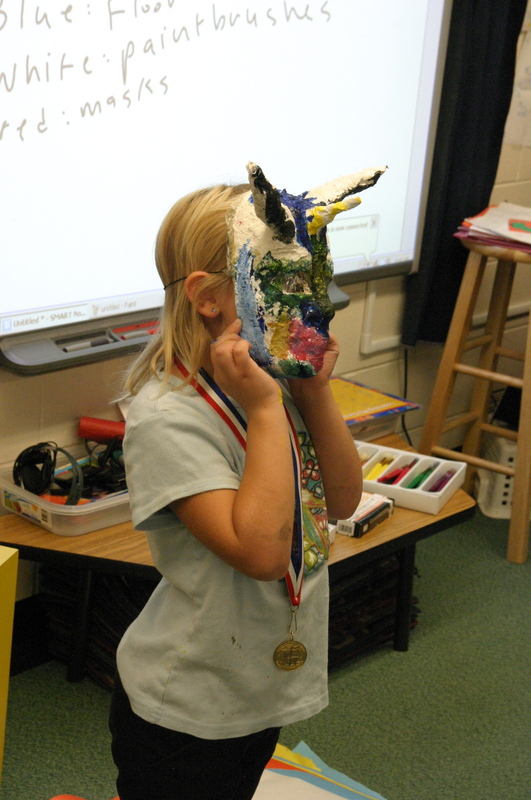 Her lesson was creating masks that gave the students special powers. 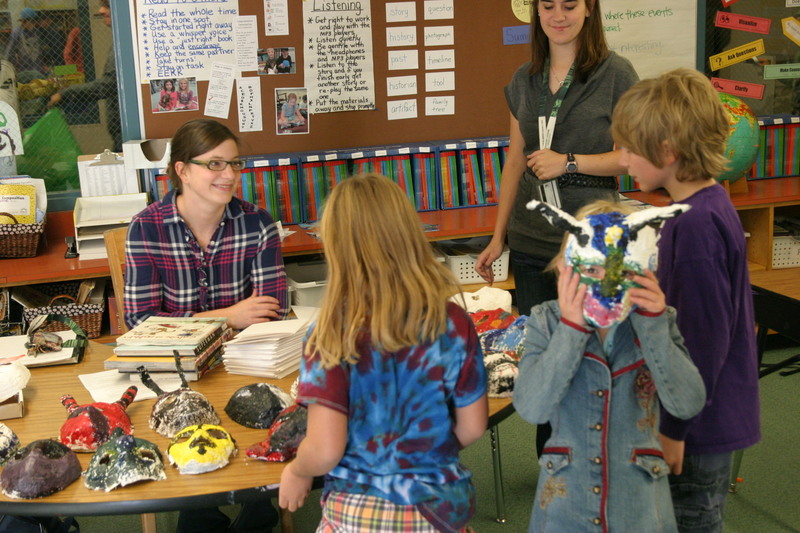 In this photo Ally shows here students masks from various cultures such as, Alaska, Canada, and Africa. As teachers we will all run into the dreaded technology meltdown. Minutes before class started Ally realized her PowerPoint was e-mail incorrectly, and half of her presentation was missing. She was able to keep her composure and decided to use the paint application on the smart board instead. 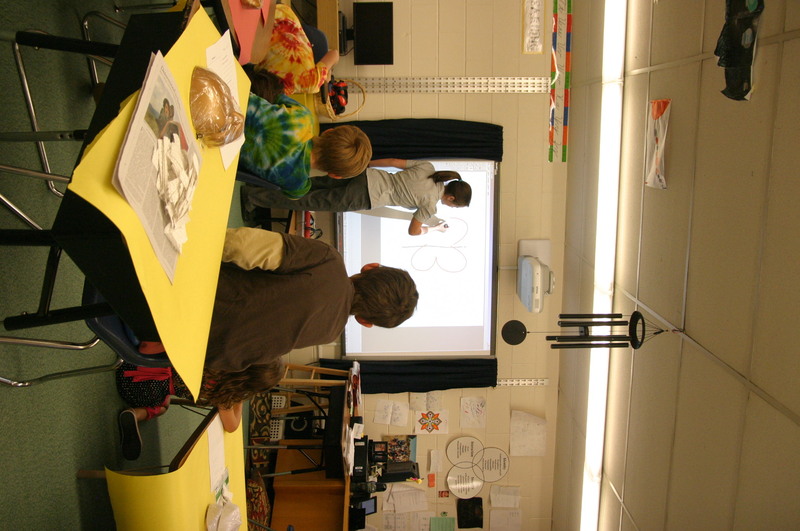 Ally kept students engaged by allowing them to draw their interpretations of symmetry on the smart board. Ally’s ability to problem solve quickly under stressful conditions was very impressive. 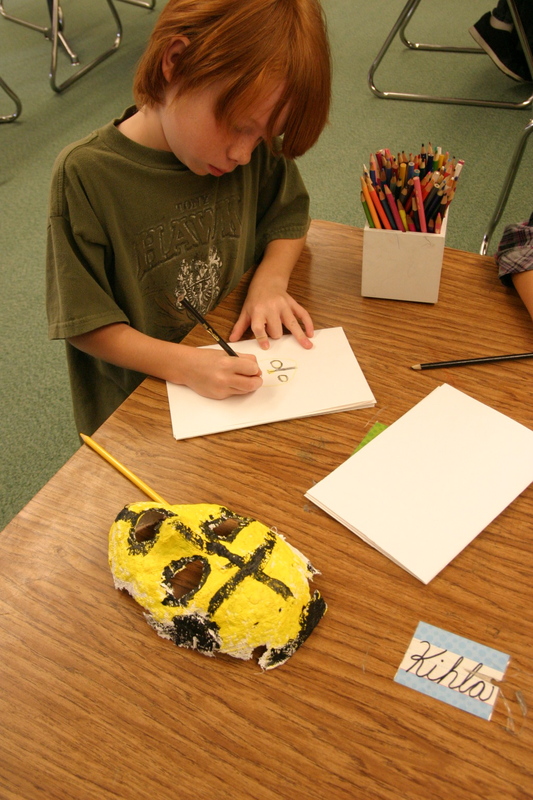 After the slide show Ally transitioned the lesson towards having the students create preparatory drawings of their masks. This was a great way to incorperate literacy into the lesson. 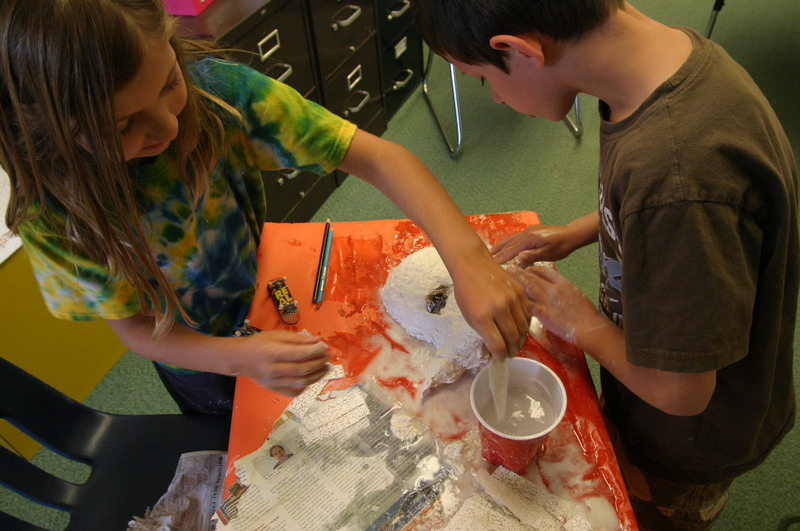 It also helped students envision their final product rather than simply jumping into the plaster process. 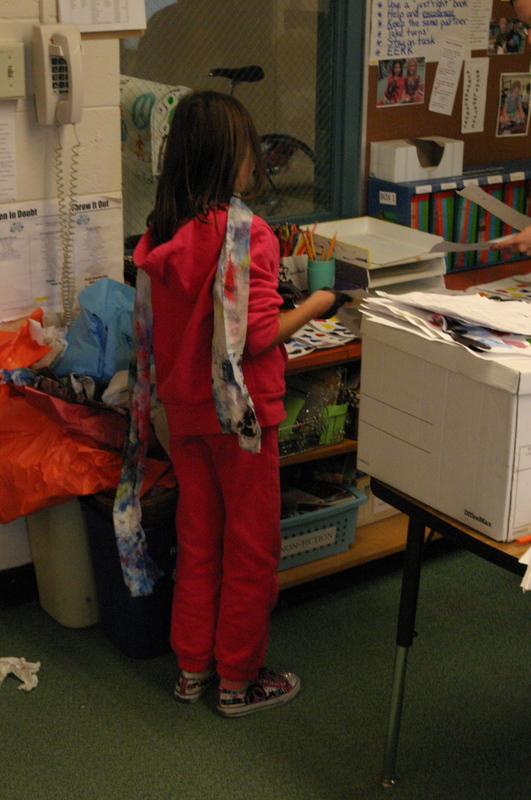 This student explained that her mask would help her save the environment. 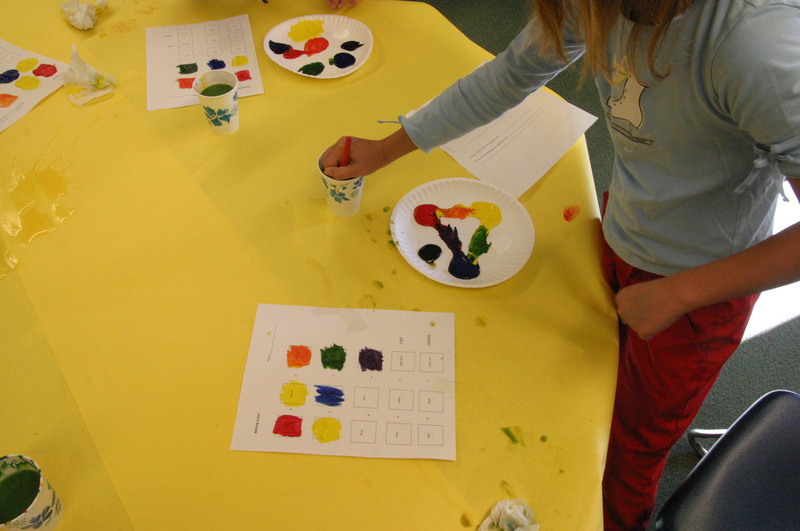 She also explained that she would use calm colors such as blue, purple, and green, because nature is calm. 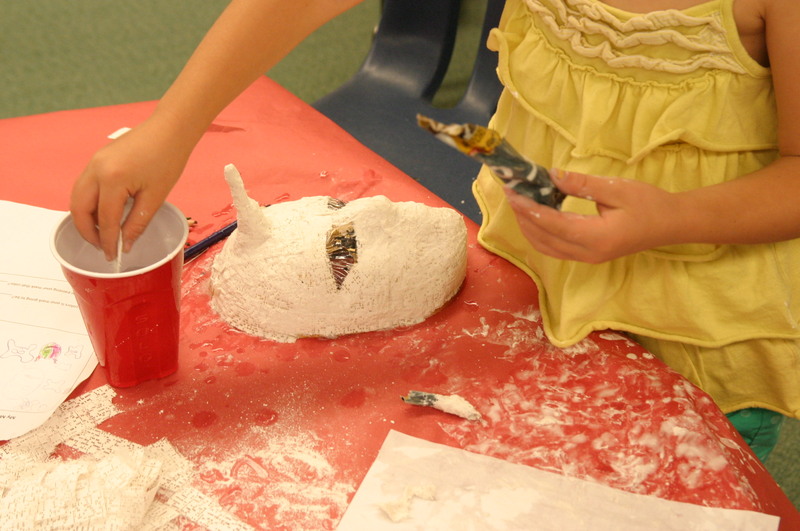 Ally gave an informative demo on how to create the plaster masks. I was impressed with Ally at the end of the demo, she asked, “Are there any questions? 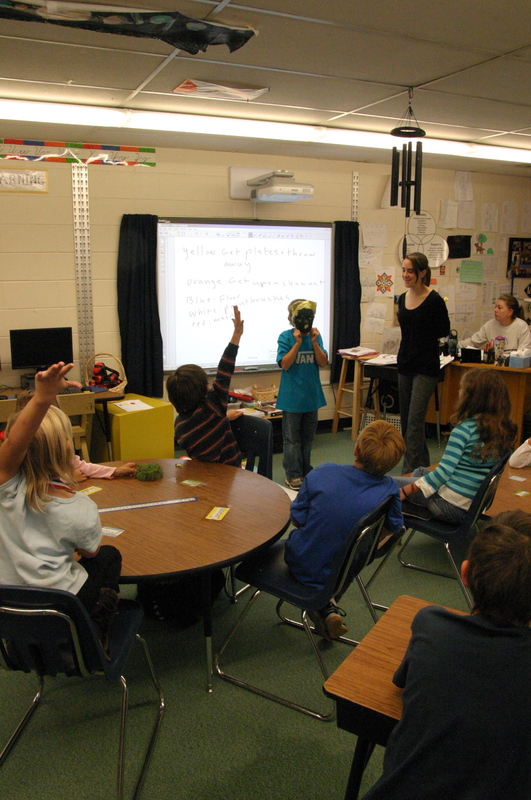 If we begin working will you know what to do?” These simple questions were very useful in evaluating if what she had just taught was understood by the students. I wonder if instead of doing the demo on the floor she should have done the demo on a large table; that way students could gather around more evenly and she would be able to see everyone. I asked what term we would use if both horns were exactly the same on both sides, reinforcing the lesson onsymmetry. Then we discussed what we would define D’s mask as a-symmetricalbecause it was a little uneven. When talking with D and E about symmetry our conversation then moved on to relate to other aspects within our lives, and that it is ok to accept a little imperfection. This was a good moment for me because the three of us were able to use the concepts within the art room to talk about life lessons. 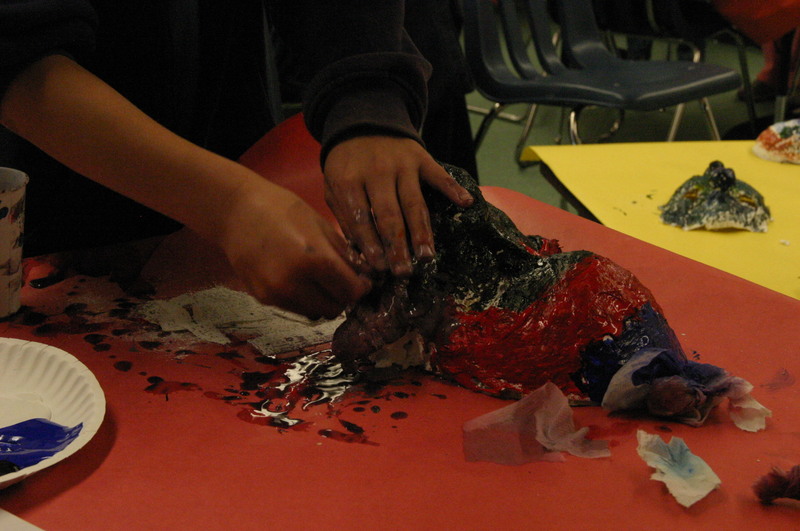 Students work collaboratively in order to finish D’s mask on time. Clean up was the weak point of the lesson once again. 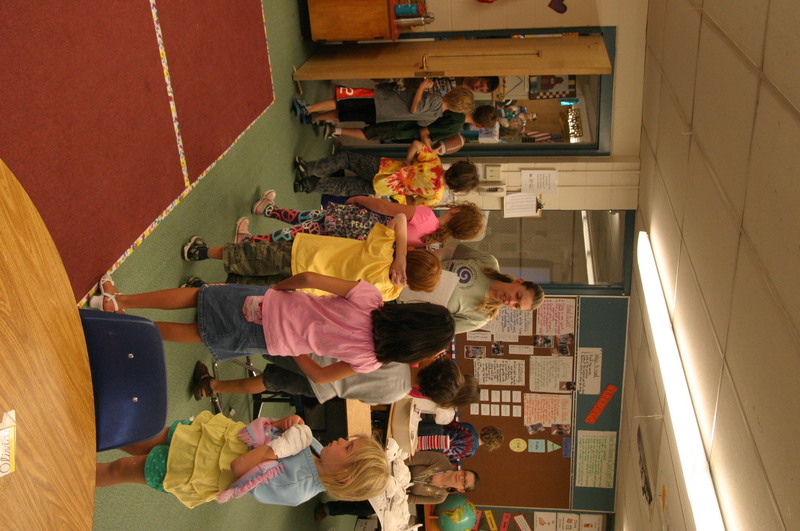 Ally, Jackie, and Tanner were left to clean up some of the left over mess as students filed out the door for recess.